The 2018 Toyota Corolla is a safe choice. Literally. Credit a standard features list that includes active safety equipment such as a forward collision warning system with automatic braking, adaptive cruise control, lane-departure warning, lane-keeping assist, and automatic high-beam headlights. No doubt, the Corolla proves an exemplary value for safety-conscious consumers. Ignore its extensive safety kit, though, and the Corolla is a rather disappointing thing thanks to its dull styling, woefully underpowered engine, and antiquated infotainment system. Fortunately, there’s hope for Toyota’s compact sedan with the upcoming 2020 Corolla. Sharing its platform and styling with the redesigned 2019 Corolla Hatchback, the compact sedan’s future looks bright. Its present, however, is much dimmer, and consumers who prioritize driving engagement, modern multimedia technology, and a quiet cabin will find little to love about the 2018 Corolla. With a starting price of $18,600 for the bottom-of-the-barrel Corolla L, Toyota’s compact sedan offers competitive pricing right out of the gate. Sure, a Hyundai Elantra SE runs $1,650 less, but the entry-level Korean compact sedan lacks the active safety equipment that comes standard on the Toyota. To get such items in the Elantra, you’ll need to spend $22,100 on the flagship Limited model and then drop an extra $4,350 for the Ultimate package. While the Honda Civic offers these items on the $18,940 LX trim, the Japanese brand asks consumers to fork over $800 for the available continuously variable transmission (CVT) before opening up the options menu to its $1,000 Honda Sensing safety package. All in, the least expensive Civic with Honda Sensing costs $2,140 more than the Corolla. The pricing gap works further in the Corolla’s favor at the higher-end of the trim-level spectrum, and the $22,035 Corolla XLE wears a sticker that’s $4,415 and $4,765 less than the loaded Elantra Limited with the Ultimate package and the top-of-the-line Civic Touring, respectively. This Corolla XLE test-car ultimately rang in at $23,825 thanks to a $525 in-dash navigation and an $895 destination charge. 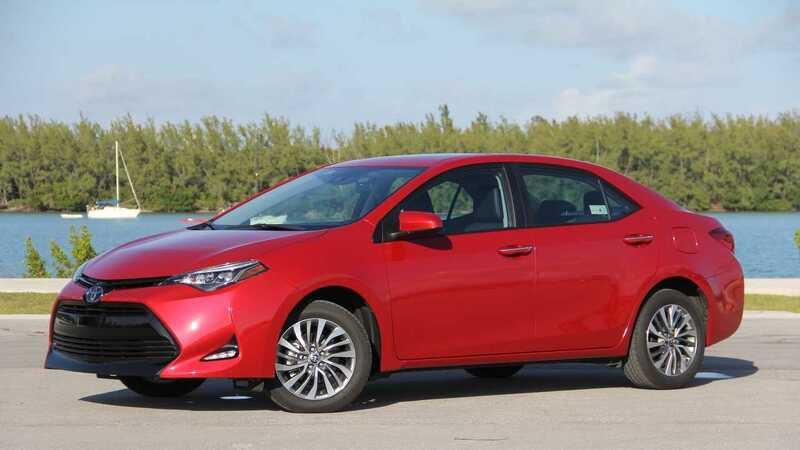 Inoffensive and unassuming, the Corolla's styling favors function over form, and its boxy shape begets ample interior accommodations at the expense of emotionally appealing looks. The luxury-oriented XLE attempts to spice things up by adding a set of fashionable multi-LED headlights (lesser L and LE models make do with simpler bi-LED lamps), bumper-mounted LED daytime running lights, trim-specific 16-inch wheels, and taillights with red turn-signal lenses (L and LE trims feature amber rear turn signals) to the mix. Even so, the Corolla remains a rather plain-looking thing; a fact exacerbated by this tester’s AARP red paint (technically Toyota calls it Barcelona Red Metallic). Toyota also offers the Corolla in sportier-looking SE and XSE trims. Yet, even these trims and their more expressive styling details fail to inject excitement into the compact sedan’s inherently mundane design. Counter to its plain exterior design, the Corolla’s interior sports a more flamboyant look. Circular air vents anchor the ends of the dashboard, while piano black finishes and a touchscreen infotainment system occupy the center stack. Alas, material quality is generally underwhelming and low-cost hard plastics line much of the dash and door panels. At least Toyota pieces everything together nicely, and the cabin suffers from no ungainly panel gaps. The Corolla’s innards are also remarkably spacious. This is especially true for those seated on the three-across 60/40-split folding rear seat. With 41.4 inches of rear legroom, the Corolla offers 5.7 and 4.0 more inches of stretch-out space relative to the Hyundai Elantra and Honda Civic, respectively. Cargo space, however, is less generous, and the compact Toyota sedan can only squeeze a measly 13.0 cubic feet of junk into its trunk. The Elantra and Civic, meanwhile, offer 14.4 and 15.1 cubes of space. Every Corolla comes standard with a touchscreen infotainment system: a 6.1-inch unit on L, LE, LE Eco, and SE trims, and a larger 7.0-inch setup on XLE and XSE models. Dubbed Entune, the systems come standard with Bluetooth and a USB port. In addition to its plus-sized screen, the 7.0-inch unit is available with an optional in-dash navigation system. It’s a worthwhile extra, given Apple CarPlay or Android Auto compatibility is unavailable in the Corolla sedan. Even in its best form, the Corolla’s Entune multimedia system feels anachronistic due to its middling ergonomics, cluttered menus, and Windows 98-era graphics. Much the same goes for the available 4.2-inch gauge-cluster information display, which sports clunky operation and an overabundance of menus. Those in search of engaging dynamics ought to look elsewhere, as the Corolla is about as exciting as a bowl of white rice. Power comes courtesy of a geriatric 1.8-liter inline-four that produces a wheezy 132 horsepower and 128 pound-feet of torque in all but the more efficiency-minded Corolla LE Eco, which makes 140-hp and 126 lb-ft of torque. In conjunction with a standard continuously variable transmission (CVT), the powertrain lazily putters the Corolla from point A to point B. (A six-speed manual is available on the sporty SE trim). Both the Civic’s standard 158-hp 2.0-liter inline-four and available 174-hp turbocharged 1.5-liter four-cylinder engines are far more affable things, as is the Honda’s more disciplined CVT. Low lateral limits and uninspired controls further conspire against the Corolla, and the sedan’s numb steering and underwhelming all-season tires incite little confidence from the driver’s seat. Same goes for the mushy brake pedal and standard 10.8-inch front disc and 9.0-inch rear drums. Yes, most Corolla models continue to use rear drum brakes, although the more driver-focused SE and XSE models come standard with a set of 10.2-inch rear discs. Sadly, the little Toyota also lacks any sense of calm or tranquility at speed, as the suspension’s soft springs are unable to mask the flinty feeling chassis or the barrage of road and wind noise that permeates into the cabin. Every Corolla comes standard with the Toyota Safety Sense-P suite of active safety features, which includes a forward collision warning system with automatic braking, adaptive cruise control, lane-departure warning, lane-keeping assist, and automatic high-beam headlights. Strangely, a blind-spot monitor is missing from the features menu. The model’s long list of standard active safety equipment, as well as its high ratings by both the National Highway Traffic Safety Administration and Insurance Institute for Highway Safety (the latter of which deems it a “Top Safety Pick”), makes the Corolla one of the safer vehicles in its class. Fuel economy for the Corolla is par for its segment, and the compact sedan returns an EPA-rated 28 miles per gallon in the city, 36 mpg on the highway, and 32 mpg combined. (The Corolla LE Eco, however, manages up to 30 mpg city, 40 mpg highway, and 34 mpg combined).